Artist’s rendering of the Resolve-class auxiliary oiler replenishment ship. Image courtesy of CNW Group/Davie Shipbuilding. Resolve-class auxiliary oiler replenishment ship is being retrofitted from MV Asterix commercial containership. Image courtesy of Davie Shipbuilding. Construction on the Resolve-class supply vessel began in May 2016. Image courtesy of Davie Shipbuilding. The accommodation unit of the Resolve-class AOR ship is developed by Almaco Group. Image courtesy of Davie Shipbuilding. The MV Asterix containership arrived at Davie’s shipyard in Quebec, Canada, in October 2015. Image courtesy of Davie Shipbuilding. The Resolve-class auxiliary oiler replenishment (AOR) vessel is a retrofit of MV Asterix container vessel to support the Royal Canadian Navy’s at-sea replenishment capability. Delivery of the ship was made in December 2017. Designed in accordance with Lloyds Register classification standards, the Resolve-class ship is intended to supply ammunition, fuel, food, water, power, and spare parts to the Canadian naval forces at sea. It can also be used for humanitarian assistance and disaster relief missions. As part of the conversion project, Project Resolve consortium was contracted to rebuild and equip the MV Asterix vessel with naval technology to military specifications. MV Asterix containership was purchased by Canadian firm, Federal Fleet Services, for conversion into a supply ship. 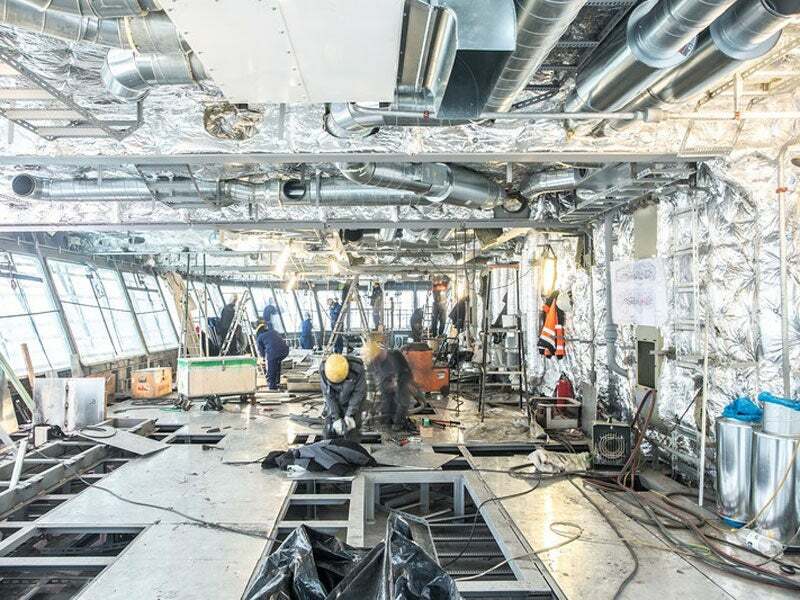 The Canadian Government awarded a contract to Project Resolve, a consortium of Chantier Davie Canada, Aecon Pictou Shipyard, and NavTech, to begin construction on the AOR ship, in November 2015. The deal also includes service support for a five-year base period with five one-year options for extension. First steel for the AOR vessel was cut at Davie’s shipyard in Quebec, Canada, in May 2016. The ship was launched in October 2017 and completed sea trials in November 2017. It is based at Canadian Forces Base Halifax in eastern Canada. The Resolve-class auxiliary oiler replenishment ship features double-hull design with a bulbous bow. It is 182.5m-long, 25.2m-wide, and 9.5m-high, while it has a full load displacement of 26,000t. The supply ship accommodates 150 crew members and up to 350 humanitarian assistance and disaster relief personnel. Its accommodation section has space for briefing, and conference rooms for command and control functions. A humanitarian processing area on-board the vessel provides triage and care for evacuees and survivors. The ship also features a large medical facility with two separate wards to house up to 60 patients. The port and starboard sides of the boat carry four rigid-hulled inflatable boats, two fast-rescue craft and two lifeboats to perform transportation and rescue missions at sea. The tween-deck carries two landing craft, vehicle and personnel (LCVP) craft for humanitarian missions, as well as for transportation of personnel, vehicles, and stores. A large flight deck is provided at the stern to support ship-to-shore airlift operations conducted by two embarked Cyclone CH-148 helicopters, which will be housed in two hangars located next to the accommodation unit. Up to four Nato STREAM-type replenishment-at-sea masts are installed amidships to refuel and resupply two ships simultaneously at sea in difficult weather conditions. The supply ship is capable of transporting 10,500m³ of F76 marine diesel fuel, 1,300m³ of F44 aviation fuel, 400t/day of fresh water, 300t of ammunition, and significant power. The fuel will be stored in pre-fabricated tanks featuring triple-protection walls. A vehicle bay located on tween-deck is intended for carriage of trucks, light armoured vehicles and jeeps. The bow section has a protected containerised storage area for storing 38 containers, including 20 refrigerated, ammunition and supplies. The containers can be loaded or unloaded using two 30t cargo cranes. The supply ship is outfitted with L-3 MAPPS integrated platform management system (IPMS), which allows the crew to monitor and control the propulsion systems, electrical units, auxiliaries, and damage control machinery on-board the vessel in real-time. The capabilities of the IPMS bridge system include on-board training system (OBTS), battle damage control system (BDCS), digital CCTV system, and condition-based maintenance (CBM) systems. The bridge system also integrates the vessel’s combat management and navigation systems to provide safe and efficient operation of the ship. A SHINCOM 3100 all-digital secure voice system is installed to manage all internal and external communications of the ship. In addition, the supply vessel incorporates L-3 MarCom integrated communications system, as well as L-3 KITE tactical and secure voice switching systems and terminals. It also includes networks system, a Symphony automated communications management tool, in addition to entertainment, broadcast and alarm systems. The interim auxiliary vessel is powered by MAN B&W engine, driving a fixed propeller. A retractable thruster is mounted to deliver enhanced manoeuvrability and station-keeping capability. It can sail at a cruising speed of 20kt and reach a range of 10,000 nautical miles (nm). Operating as Chantier Davie Canada, Davie Shipbuilding is the prime contractor for the Resolve-class AOR ship project, while NavTech is the design services provider. Aecon Pictou Shipyard was appointed to perform fabrication work under a subcontract with Davie Shipbuilding, while VShips Canada is the ship manager. Davie Shipyard awarded an accommodation module construction contract to Almaco Group for the supply vessel in 2015. Hepburn Engineering won an order from Davie Shipbuilding in August 2015, to provide a replenishment-at-sea system. Chantier Davie Canada and Project Resolve jointly awarded a contract to L-3 MAPPS in September 2015, for the supply of the IPMS. Through its Canadian unit DRS Technologies Canada, DRS Technologies won a contract to provide integrated communication systems in October 2015. RaceRocks signed a contract in December 2015 to provide training services for the AOR vessel. Davie Shipbuilding awarded a contract to OSI Maritime Systems to supply and install an integrated navigation and bridge system (INBS) in the Resolve-class supply ship in January 2016.